Belper's Cemetery is on Matlock Road. The burial of the dead was, for many centuries primarily dealt with by the church. However, during the period between 1852 and 1906 when churchyards became full to capacity, special provision had to be made by Parliament for the purpose of providing more space for the disposal of the dead. Many new cemeteries were created during this period, managed generally by a burial board and with ownership belonging to the local towns. The passage of time has seen gradual changes over the years, more land has been purchased and all the cemeteries have expanded. In 1973 Amber Valley Borough Council took over the management of the cemeteries. With more emphasis on ‘customer’ requirements and environmental management the original traditional lawned cemetery is now developing. 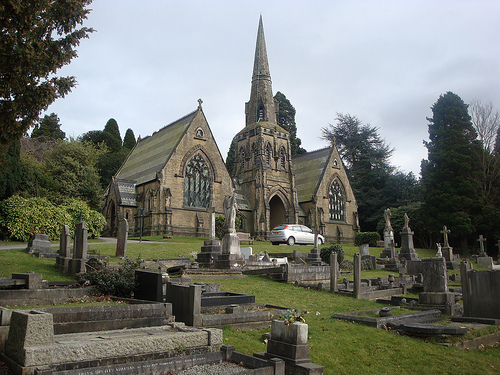 The Council has responsibility for managing and maintaining the cemeteries at Alfreton, Heanor, Ripley, Codnor and Belper. Burial Registers for Belper Cemetery for the period 1861 to 1884 have been deposited at the Derbyshire Record Office at Matlock. Ongoing records are kept at the offices at the Cemetery itself. As there are so many entries it's unlikely they will ever be transcribed. World War I Victoria Cross Medal Recipient. He served as a Gunner in the 83rd Brigade Royal Field Artillery. On March 21, 1918, at Caponne, France after being at his gun for six hours under heavy gas and shell fire, Gunner Stone was sent back to the rear with an order. He delivered it, then under a very heavy barrage, returned with a rifle to assist in holding the enemy on a sunken road. First lying in the open under heavy German machine-gun fire and then on the right flank of the two rear guns he held the enemy at bay. Later he was one of the party which captured a machine-gun and four prisoners. For most prestigious gallantry, he was awarded the Victoria Cross Medal and promoted Bombardier. A. Weaving is also buried in Belper Cemetary. He received a letter from the King commending him for his battle actions. The Weavings have lived in Belper for over 100 years.